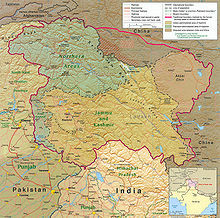 Political Map: the Kashmir region districts, showing the Pir Panjal range and the Valley of Kashmir. ↑ Nehru, Jawaharlal Nehru. "Pandit Jawaharlal Nehru". GENI. Retrieved 13 July 2014.